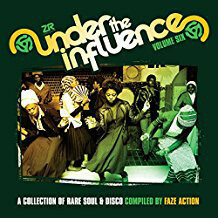 The latest volume in the crate-digging disco series, Under The Influence, now compiled by Faze Action. Featuring another brilliant selection of disco rarities, smooth '80s boogie, juicy funk and obscure versions of classic dancefloor hits. Along with killer edits by Faze Action, who both really dug incredibly deep on this one.